Why Are Astronauts Moonwalking on the Bottom of This Giant Pool? At the European Space Agency's Neutral Buoyancy Facility, astronauts train in weighted suits at the bottom of one of the world's deepest pools, to prepare for spacewalks on the moon. With government leaders and space organizations aiming to send astronauts back to the moon, how do astronauts train to work on the lunar surface? A really, really deep pool. At the European Space Agency's (ESA) Neutral Buoyancy Facility (NBF) at the European Astronaut Centre (EAC) near Cologne, Germany, astronauts train in a unique and extreme environment. ESA's NBF houses one of the deepest swimming pools in Europe. And at the bottom of this 33-foot-deep (10 meters) pool, you'll probably find astronauts working on a simulated lunar surface. Astronauts in weighted spacesuits participate in the European Space Agency's "Moondive" study in a 33-foot-deep (10 meters) pool. 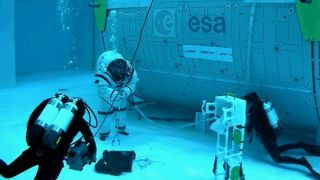 "The beauty of the water immersion in the ESA-NBF is that we can simulate not only long-duration weightlessness but also partial gravity, such as [that] on the Moon or Mars, by fine-tuning the negative buoyancy of the astronauts and all of the equipment they use," Hervé Stevenin, ESA's head of EVA training and NBF operations at the EAC, said in a statement. Images of astronauts in a pool are reminiscent of Apollo astronauts practicing their planned ocean landing with model spacecraft and swimming pools. And, in a finding that hearkens back to these early days of spaceflight, the astronauts who currently train at this facility have found that "the optimum walking strategy in this finely-tuned negative buoyancy turns out to be to kangaroo jump, just like the Apollo astronauts did on the moon," Stevenin said. The prime crew of NASA's Apollo 1 mission practice water egress procedures in a swimming pool at Ellington Air Force Base in Houston, Texas in 1966. Astronaut Ed White rides a life raft in the foreground. Crewmate Roger Chaffee sits in hatch of the boilerplate model of the Apollo space capsule while Virgil "Gus" Grissom waits inside the spacecraft. On a spacewalk, astronauts may be working on repairs on the International Space Station or even performing geological sampling on the lunar surface. Because lunar gravity is drastically different from Earth's, astronauts require extensive training to be able to work effectively in these environments. The "Moondive" study takes this into consideration, focusing especially on how to best prepare astronauts for a lunar spacewalk. "We focused on the techniques and technology we will need to prepare astronauts for future missions to the Moon," Peter Weiss, head of the space department at Comex, a French company that specializes in the exploration of extreme environments and leads a consortium which runs "Moondive," said in the statement.